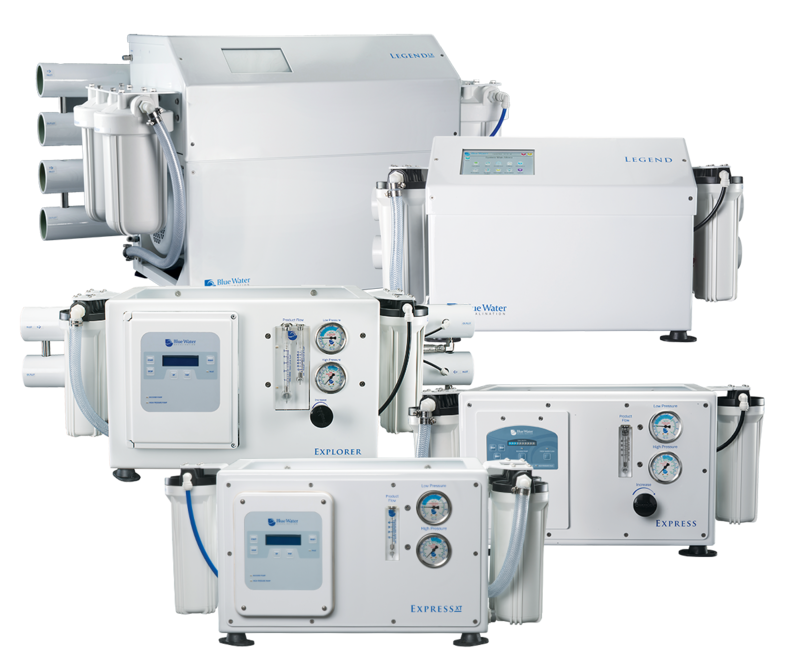 Blue Water Desalination offers five distinct lines of watermakers to suit the needs of the most discerning mariners, from the day fisherman up to the long-range sailor and transoceanic yachtsman. Within the five lines, we offer dozens of models of varying capacities in both frame and modular style configurations along with high-output commercial systems that can be custom designed for many different applications. Our yacht desalination systems combine the best in simplicity and cutting-edge performance. From our compact Express series to our fully-automatic Legend series, we offer a system for any sized yacht from center consoles to megayachts. With a bevy of standard features available, along with upgrades including an industry leading 7” full-color touch screen and touch screen remote, our watermakers are sure to make your boating experiences safer and more convenient. With a choice of semi-automatic or fully automatic operation, a wide range of capacities and the availability of modular and compact set ups with three-phase motors, our systems are an excellent choice for commercial applications. Blue Water rises above the competition in features, ease of use and ingenuity. We continually work to improve and add to our product lines, so if one of our current systems does not meet the freshwater demands of your commercial vessel, a Blue Water representative would love to discuss a customized watermaker solution with you. All systems are also available in modular, customizable component versions and we offer a full lineup of filters, remotes, fluids and other accessories.